I believe nothing in this world is more cruel than Human. According to the Buddha’s teachings, it is great merits to be born as a Human. We live in a World where we can work hard to achieve the type of life style we want, where we want to stay and who we want to live with. We have the intelligence to understand things that other living beings (those that you can see) cannot understand or have minimum understanding…however some of us are better described as in Chinese translated…”worst than animals”. Animals kill for food and only when they are hungry. Animals have little brain but they know loyalty. Animals react when provoked. Animals lived in their own habitats and with their kinds but unfortunately some animals are branded as “PETS”. These are tame animals and therefore are brought into homes to serve as “entertainment” to their owners. Some owners are loving, some just need a pet around to boast of status, others…with the mentality that they are forced to take on because their kids discarded or their parents discarded and they have no feeling for these creatures. Animals, like Human has a life. They are living things. Like Human they have feeling, they can feel pain, they are sensitive and they can feel what you feel. If you have fear so do they. If you are afraid of death, so do they. Does it mean that if they cannot talk or expressed themselves, Human has the right to demean them? When an animal attacked us, we said that they are ferocious, dangerous and they need to be killed or they need to be caged – so what happen to Human who were cruel to animals? I am angered by what happened to a little helpless dog. This little thing was defenseless against Human. If you have no love for animals, do not take a pet. Pets need your attention. They are not cheap to keep, as like Human, they get sick and need a doctor and that is expenses. Dogs need food as Human need food and this is also expenses. Unfortunately dogs are not Human when they come to personal hygiene. Some dogs are well trained and they do their ‘’businesses’’ in allocated area but some are not so smart and they pee and pooh everywhere – you will have to clean it up. This small dog cannot be more irritating than another Human and what justify such inhuman, murderous act? 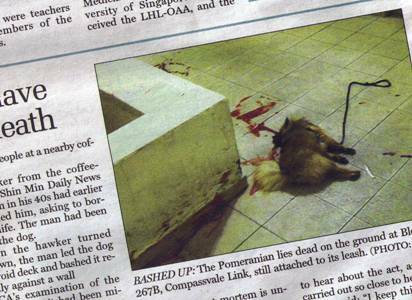 The newspaper said that the dog was smashed against the wall again and again and probably died of fractured skull. Does it pain your heart to see such? What is going through that person’s mind while doing this act? It is unforgivable! If he picked someone of his own size and intelligent, he won’t stand a chance. If in the fit of anger he can kill an animal without refraining, do you think he can kill a human when provoked? So we have a murderer on the prowl. The world is sick and I am sure there are many such people in every country and the amount of harm and abuse they did to both Human and Animals are worst than the devils. Some of the acts are unspeakable and no words could describe the notoriety. There are people who just enjoy torturing others – be it Human or Animals. The amount of violence, if you checked YouTube, Goggles, Yahoo…etc. you just have to swim around and you will find things that are unimaginable. We said that Human race have advance or are we going back to being barbaric? The era of peace and harmony are slowly going. It is like a pendulum’s swing…from the start, to the middle and now we are nearing the end. Does it mean that everything needs to be destroyed and the world will start all over again? Can send me the news..